I've wanted to try some form of body oil for a while now. I don't have extremely dry skin, but areas of my body such as my shoulders and back tend to get a little dry from time to time. I originally considered purchasing the Supple Skin Oil, but at £29 it really isn't cheap, so I settled on this as it's slightly more wallet friendly. My first impression was that it smells divine, and I would happily slap anything on my body that smelled like this! I find that the scent lingers on my skin, so I get to enjoy it that little bit more, and not only does it smell amazing, it actually does the job. My skin feels super soft after using this, and it cleanses far better than most shower gels I've used. When the oil hits water, it transforms into a milky foam which makes it easy to spread around the body without losing the product down the drain before you can cleanse thoroughly. The only disappointment with the Almond Shower Oil is that I don't think a little goes along way, which is a shame but it won't put me off purchasing again. However, next time I think I'll buy the 500ml Eco-Refill of the product as it's only £20, making it much better value for money. This is the first L'Occitane product I've actually tried, so if you have any other recommendations from them please comment and let me know! 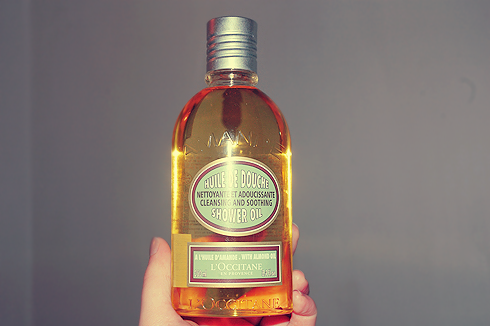 L'Occitane product are absolutely divine and this one doesn't sound like it's the exception! They have some really great, amazing smelling deep repair hair masks. I bought them for my mumma and ended up stealing them for myself! I could probably do with a deep repair hair mask, I'm trying to let my hair grow longer and it's getting pretty dry in the process! I love this shower oil! It smells so amazing; I wish it wasn't so expensive though.